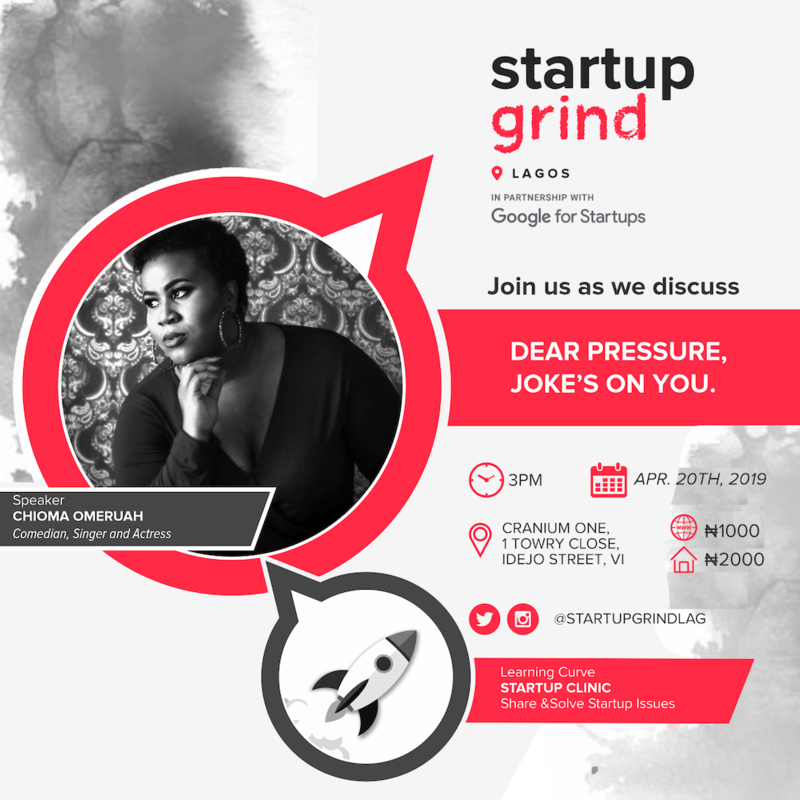 Startup Grind Lagos (SGL) is set to host multi-talented entertainer, Chioma "Chigul" Omeruah at their next meetup on Saturday, April 20. Startup Grind is an organisation that provides safe spaces for entrepreneurs to share pieces of themselves and their work. Monthly, attendees get the opportunity to meet and learn from like-minds and succeeding entrepreneurs from different works of life. Last month, it was the turn of media entrepreneur, Tosin Ajibade. This month, they will be speaking to the multi-talented comedienne, actress and singer, Chigul. The theme of this month is Dear Pressure, Joke's on you. Sounds about right and witty, especially as the invited guest for this month is a comedian 😊. Typically, when people refer to entrepreneurs they have images of tech startup founders running companies that providing consulting and managed services to businesses or founders operating in a consumer space. But rarely, does it come to the mind that entertainers are also entrepreneurs. Therefore, SGL's decision to host a comedian is timely and different. We asked the Lagos Chapter Director, Mr Uwem Uweakpan about their reason for choosing Chigul, the comedian. He said, "She has a compelling story filled with failures, mistakes and near-misses. She always had to deal with the pressure to succeed because she is multi-talented. Entrepreneurs face similar pressures, because we 'cannot' afford to fail", replied Uwem. In a statement sent to benjamindada.com, Blessing Abeng, co-director, Startup Grind Lagos explains that "the entrepreneur's success is often dependent on how well he or she can handle the pressure". In the spirit of doing something different, the Directors of Startup Grind Lagos have announced that one of the attendees will receive a gift. Interested attendees would need to be present at the event's venue no 1, Towry Close, off Idejo Street, Victoria Island, Lagos on. Tickets are on sale online for N1000 to help the SGL team cover logistics cost, however, at the venue the ticket price will double. The event is proudly supported by benjamindada.com, The Afropreneur, Connect Nigeria, and Einsteinette Limited. P.S—One of Chigul's failure is her attempt at a law degree in the US, but learn more at the event on Saturday, April 20. Watch her TED talk here.